Many are familiar with the tale of Little Red Riding Hood and her trials of making it through the woods. 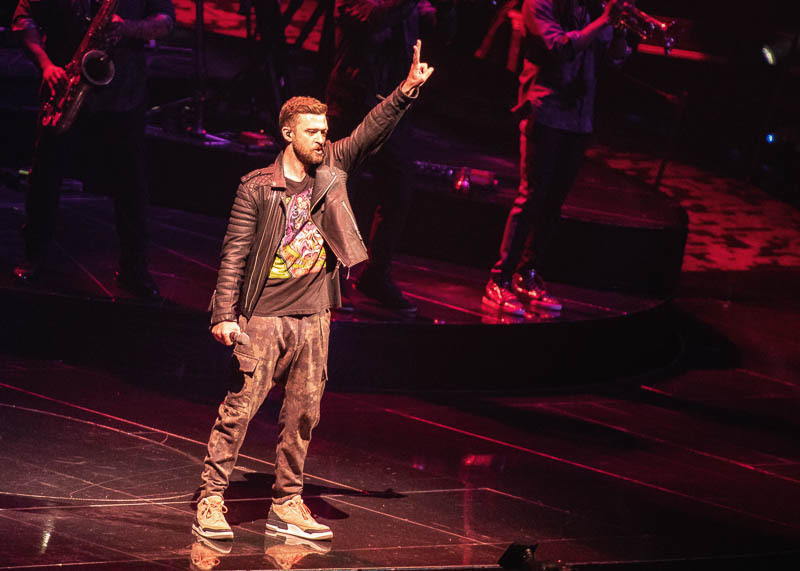 Justin Timberlake (JT) decided to put a twist on that fairy tale by luring throngs of screaming girls into the woods during his recent performance at Oracle Arena. 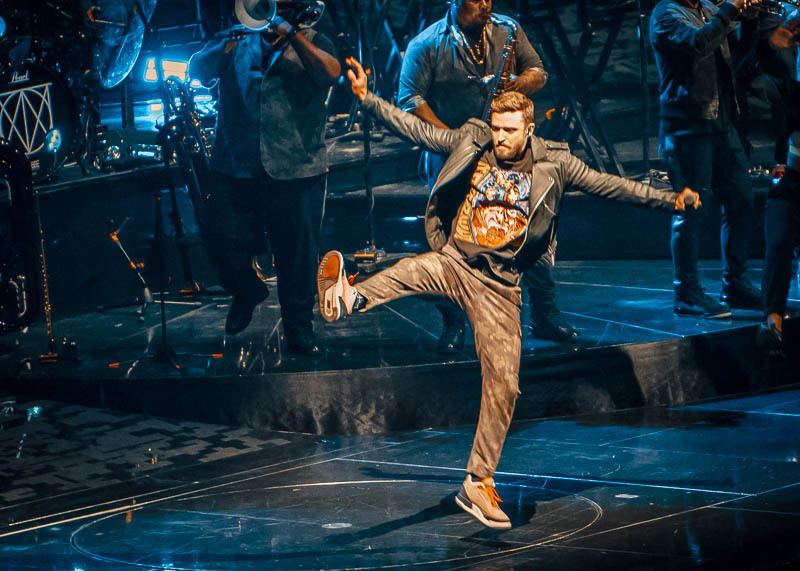 Reprising the big bad wolf role of dangerous tempter with his mischievous and playful innocence, JT mesmerized the captive audience that trekked to Oakland to finally see him get down with his Man of the Woods (MotW) tour. 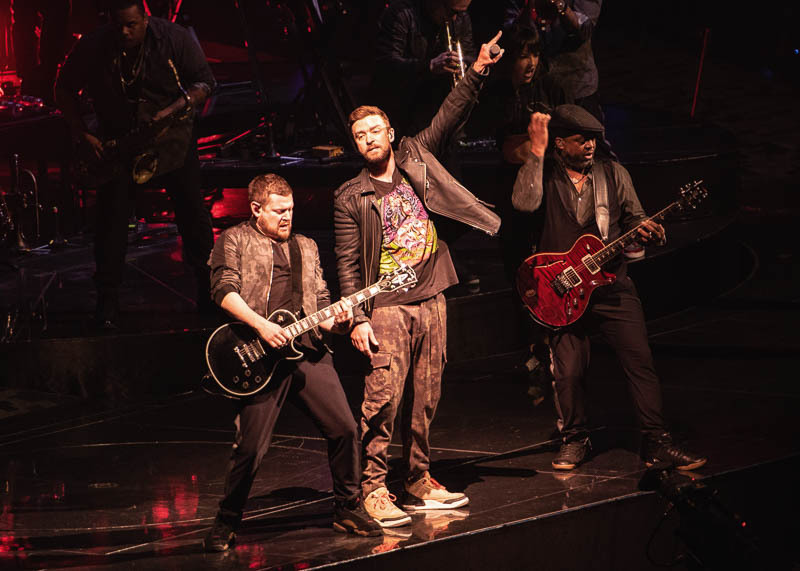 Shaking off the admitted frustration of cancelling a number of fall ’18 dates (including a December date at Oracle) due to bruised vocal cords, JT and the Tennessee Kids (his stellar crew of musicians and dancers) stormed the East Bay intent on squaring the books with their fans. 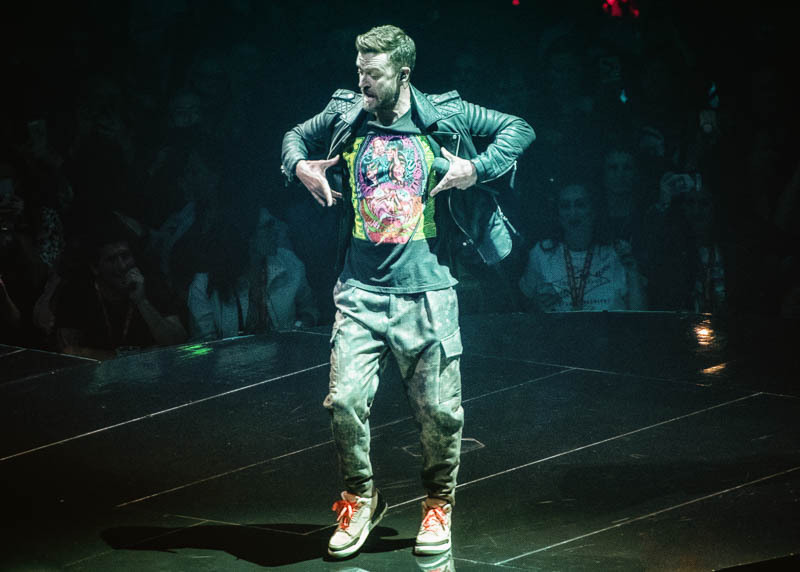 Timberlake has been ‘on-stage’ since he was very young, using a stint in the All-New Mickey Mouse Club (which also included Ryan Gosling, Britney Spears, and Christina Aguilera in the cast) during his early teens as the springboard to his later global super-stardom. That being the case, he has always said he feels most at home on-stage. On this evening, that fact was very evident. 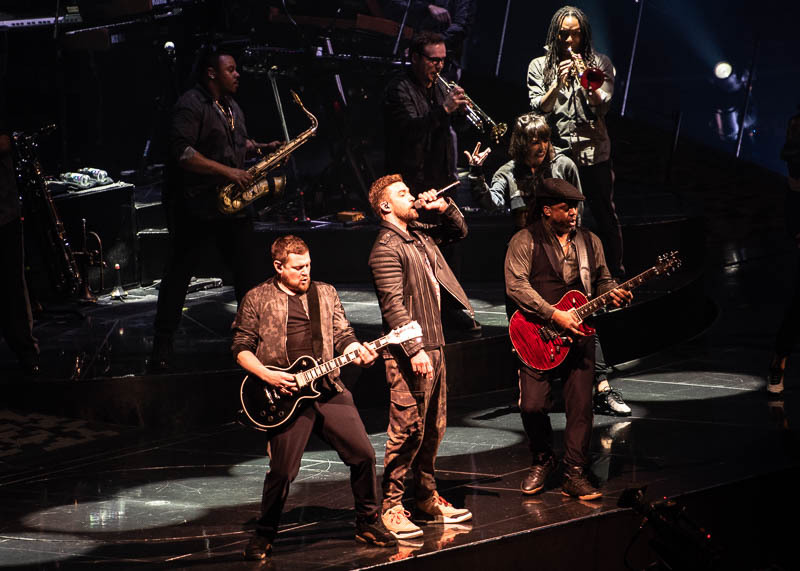 The band took the stage first, and when Timberlake appeared, the roar of the crowd (80+% female) was reminiscent of the type of ovations received by the Beatles…. high pitched screams, jumping up and down, pulling hair, etc. The biggest difference was the sea of cell phones that tracked his every move. Kicking the set off with ‘Filthy’ (lead track off MotW), JT started right into his ‘want some candy little girl’ big bad wolf character. ”Haters gonna say its fake…..put your filthy hands all over me, you know this ain’t the clean version”. 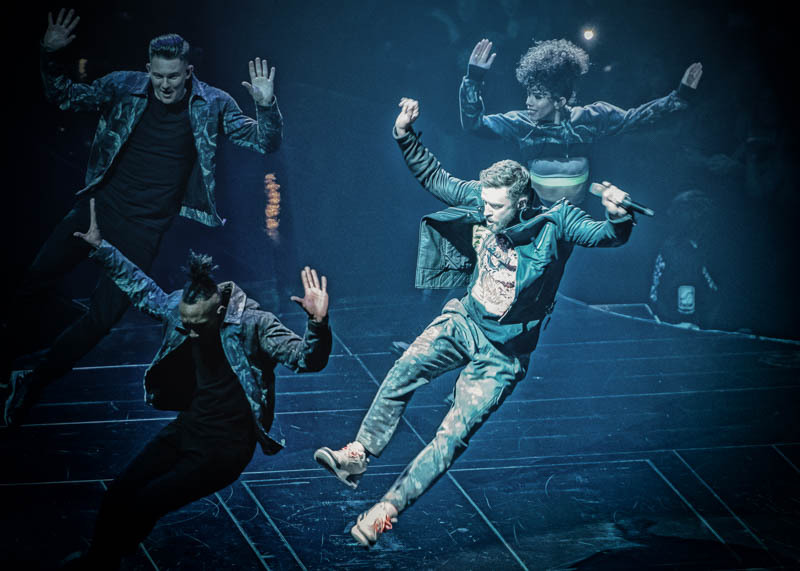 Using his smooth tenor voice backed up with free-flowing moves that were surely lifted from the Michael Jackson dance playbook he vigorously studied growing up, Timberlake had his adoring fans in the palm of his hand. He worked the innovative layout of the stage, which stretched across the venue (mainstage with a serpentine runway that cut through the crowd on the floor to a mini-stage at the far end of the arena) from end to end. In doing so, at some point of the night he made everyone in the room feel like he was performing right in front of them. The thought to detail of the lights, choreography, and imagery of camping in the forest was executed flawlessly, the type of Hollywood-styled production that folks come to expect for the exorbitant entrance fees that now accompany seeing A-list stars. By campfire singalong, I don’t mean it was like imagining him singing at a campfire, he actually had a campfire on-stage surrounded by trees. His dancers/musicians then gathered around with blankets and other campfire instruments to complete the scene, which as a bonus came with a faux-sky alit with cellphone stars. It was really cool, but the way JT commanded the stage, it would have had the same impact if he was singing acapella in front of the television yule log. There were no extended gaps between songs, no intermissions, no costume changes. Timberlake was out there in jeans, and a jacket covering a hoody…. just like he was out in the woods. It was refreshingly without the pretense that usually accompanies stars of his magnitude. 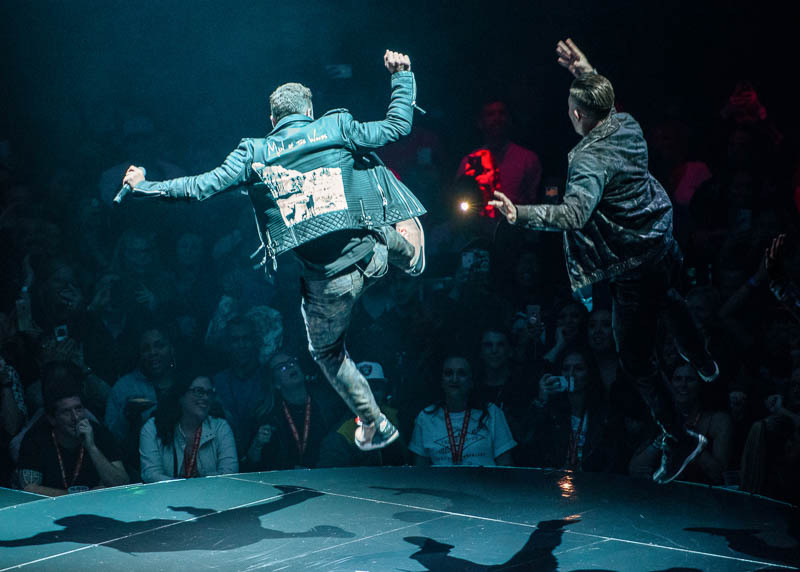 When he turned back the clock to 2002 for a super-charged version of ‘Rock Your Body’ (Justified), the hinges came off of Oracle….it was like he was performing in a bounce house with the way folks were shaking and moving. By the time he closed the show (no encore) with the sunshine vibes of ‘Can’t Stop the Feeling’, an invigorating Jackson-esque groove from the Trolls soundtrack, it felt like a carefree summertime camping trip, even though the crowd was about to be released into a chilly late-winter night. 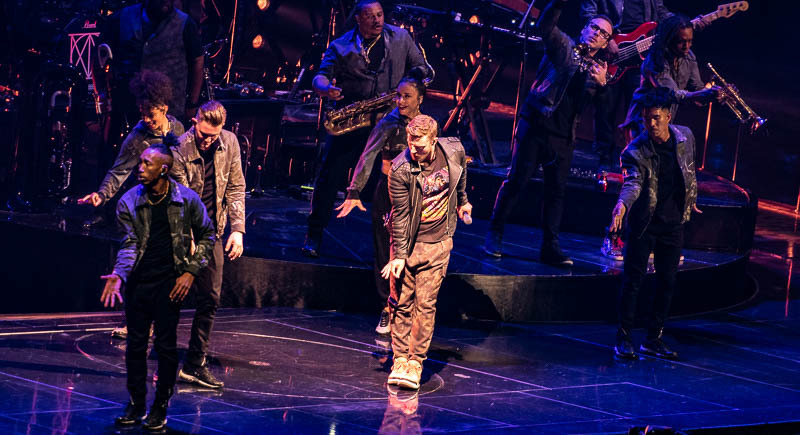 While Justin Timberlake played the role of pop-star big bad wolf, it didn’t take much coaxing to get the Little Red Riding Hoods in the crowd to follow him into the woods to trip out and dance for two hours. The real convincing that underlies his performance is his quest to establish himself as an entertainer worthy of making a claim to the throne of pop royalty that was left vacant by the untimely departures of trailblazers Prince and Michael Jackson. Claim made……now who are the other challengers in this pop game of thrones? Setlist: Filthy | Midnight Summer Jam | LoveStoned | SexyBack | Man of the Woods | Higher Higher | Señorita | Suit & Tie | My Love | Cry Me a River | Mirrors | Drink You Away | [Video Interlude] | Until the End of Time | Morning Light | What Goes Around… Comes Around | Say Something | Montana | Summer Love | Rock Your Body | Supplies | Like I Love You | Can’t Stop the Feeling! Mark Paniagua is a bay area native who grew up on the SF music scene as a musician and sound engineer. Playing local clubs since the late 80's in bands such as Ringchildren, Sorrow Town Choir, and Fuzzbucket, Mark is an accomplished bassist and vocalist. He has also played and performed in a number of rock musical productions with Buzz Skycastle crew, including Jesus Christ Superstar, Pink Floyd's The Wall, The Rocky Horror Picture Show, and Abigail the Rock Opera.